It is vitally important to house species in appropriate groups. For many species social living provides more benefits than finding food or avoiding predation. It is a major source of stimulation and enrichment. The social environment of many species represents a constant source of mental stimulation, the complexity and variety of which animal keepers cannot replace by any form of environmental enrichment (Young, 2003). Changing social groups and dynamics and removing an animal for training, performance or transport can lead to periods of social isolation or can bring animals into contact with new groups. Often, individual animals are exchanged between circuses or lent to another circus for a season, resulting in long-term disruption of social groups. Social species, such as elephants, are often kept in isolation, while animals who are naturally solitary, such as tigers, are often kept in groups (Nevil and Friend, 2003). The detrimental effects of social deprivation and separation have been widely documented in many species and are known to cause behavioral and physiological indications of stress (Tarou et al., 2000). In a study of social separation in giraffes, a male was removed from his two female companions. The females then displayed protest behaviors, including increased activity, stereotypical behaviors, and increased contact with each other. They also showed decreased habitat utilization. These results were consistent with the findings of studies of other species, particularly nonhuman primates. In such studies the first change in behavior is protest, characterized by increased vocalization, motion and stereotypical behavior, as well contact and clinging if the animal is housed with peers during the separation. Giraffes are not known to be highly social animals in the wild, yet their aversion to this kind of social separation proves that a complex social structure is not a prerequisite for social attachment (Tarou et al., 2000). Investigators documented spectacled bears displaying stereotypic repetitive head-tossing as a result of social frustration when they were prevented from interacting with other bears who were in close proximity to them (Fischbacher and Schmid, 1999). In the wild, elephants live in groups and display complex social behavior. The natural grouping of both African and Asian elephants is of a family unit, and the social bonds among the members of the family are very strong (Macdonald, 2004). Such family units are not possible in circuses, where elephant groupings are varied and changeable. Supporting this, a study on circus elephants found that the limited opportunity for social contact was the principle factor in the female Asian elephant’s stereotypy (Kirkden and Broom, 2002). Piglets isolated from others showed increased sitting, pawing behavior and escape attempts and decreased activity, play and interest in novel objects. All these changes reflected negative impacts on the piglets’ welfare (Herskin and Jensen, 2000). Social separation in cattle induced struggling and large increases in vocalization, heart rate and plasma cortisol concentrations. The mere presence of other cattle was sufficient to prevent struggling and vocalization, regardless of peer identity, which shows that nonspecific attachments can develop between individual cows and their peers (Boissy and Le Neindre, 1997). Tigers in the wild are solitary animals, coming together only for mating. A study on circus tigers described how circuses often transport tigers in groups and that severe fights can break out (Nevill and Friend, 2003). ‘Major movement’ in the back of a truck could be felt by a driver, indicating fighting. Whenever this happened, the method of stopping the fight was the ‘sudden application of the brakes,’ which would cause the fight to stop until the truck could be parked, and a handler could separate the tigers. This was clearly an unacceptable situation. Traveling circuses frequently put different species of large cats together and have even created a lion-tiger hybrid, calling it a “liger.” Putting different species of large cats together can lead to serious aggression, as when a male tiger attacked a lioness, causing very serious injuries. Studies of captive grazing and browsing species have shown that increased social density may produce competition for resources, especially food, which could then increase the likelihood of stereotypic licking (Bashaw et al., 2001). 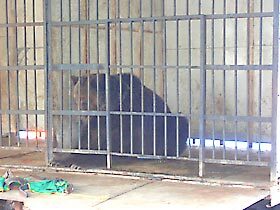 Besides suffering from the effects of isolation, animals suffer when forced to live in close proximity to other species, as is often the case in circuses. The suffering is further increased when the other species is a natural predator or prey of the animal in question, as documented in ADI observations. When next to cattle or pigs, farmed red deer stayed as far as possible from them and were generally more active, showed agonistic interactions and had elevated plasma cortisol concentrations. Despite previous familiarization of some of the deer with the cattle, the ‘more experienced’ animals did not habituate to the unusual grouping. In fact, evidence suggested that previous exposure to cattle made red deer more aversive to them (Abeyesinghe et al., 1997). Obviously, ruminants and omnivores like pigs do not pose a predatory threat to deer, but they may pose other threats. Firstly, they are not familiar to deer and are thus perceived as a potential threat. Secondly, they may be competition for resources. Thirdly, different species have evolved specialized means of communicating with one another. The unpredictability of noise from another species and an inability to read each other’s signals may cause problems in mixed species groups (Abeyesinghe et al., 1997). Prey species have adapted to recognize, avoid and defend against predators (Apfelbach et al., 2005). However, in the restrictions of a traveling circus, animals such as horses, other ungulates and smaller animals are frequently exposed to one or more predators, such as dogs, tigers, lions and bears. Predators may also become stressed and frustrated by the presence of prey species, whom they are unable to hunt or slaughter, or of competing predators, with whom they cannot compete. Studies of mammalian changes in behavior when exposed to predators have shown such responses as anxious behavior and long-lasting neural circuit changes in the brain (Adamec et al., 2005). For many mammalian species an adaptation for predator avoidance is sensitivity to predator odors. The latest research on the effect of predator odors in mammalian prey species describes how pregnant female rodents exposed to such odors may have given birth to smaller litters. Exposure to such odors in early life can also hinder normal development. The paper documents studies of a long list of mammalian species who avoid predator odors, including, rodents, opossums and sheep (Apfelbach et al., 2005). Behavioral effects in animals exposed to predator odors include inhibited activity, suppression of nondefensive behaviors, such as foraging, feeding and grooming, and shifts to habitats or secure locations where such odors are not present (Apfelbach et al., 2005). Even closely related animals, such as different species of exotic cats, can be averse to the presence of other species. A zoo study investigating the low reproductive success rate of small exotic cats in captivity pointed out that most of these cats are solitary in nature. However, in captivity they are routinely housed in pairs and managed in close proximity to other species of small cats and larger cats, whom they may perceive as potential predators (Mellen, 1991) or competitors for resources and territory. Cats try to avoid contact with other cats and show abnormal and stress behaviors when competitors encroach on their territory. This was cited as a possible reason for the lack of breeding success with this species in captivity.